We’ve previously covered the launch of Cannondale’s new carbon SuperSix Evo Hi-Mod and aluminium CAAD12 ranges. 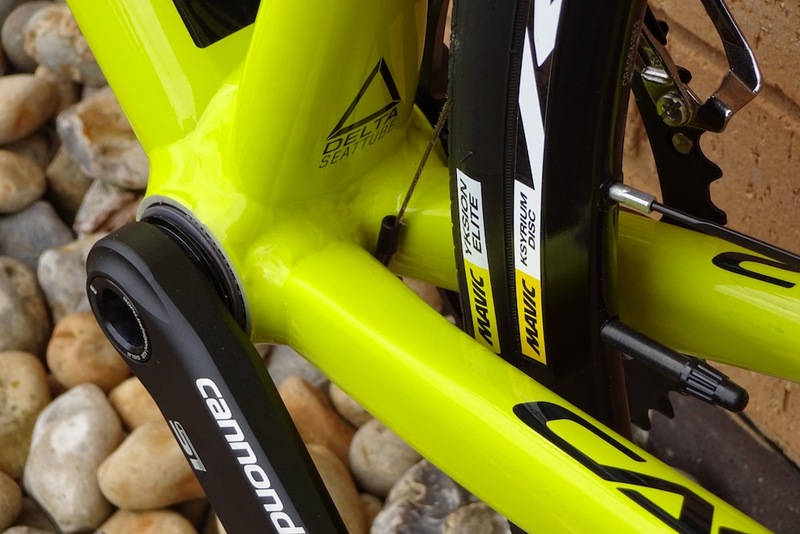 Cannondale claims that both are stiffer, lighter, and more compliant than their predecessors. Top of the SuperSix Evo Hi-Mod tree is the Black Inc version shown above. Coming with Dura-Ace mechanical shifting, a Cannondale SiSL2 semi-compact chainset and Enve Smart 4.5 tubular wheels shod with Schwalbe One 24mm tubs, it’s priced at £6999.99. The team version comes with Dura-Ace Di2 and Mavic Cosmic Pro wheels for £7499.99. Via two Dura-Ace builds, the new SuperSix Evo Hi-Mod range is completed with an Ultegra build at £2999.99. The introduction of the new Hi-Mod frame has resulted in the previous generation SuperSix Evo being pushed down the hierarchy and now available at really sharp pricepoints. We were particularly taken with this full Ultegra build (including brakes) with a Cannondale Hollowgram chainset with single forged semi-compact 52/36 chainrings and Mavic Aksium Elite wheels priced at £1899.99. The lowest speced Tiagra version comes in at £1299.99. The CAAD12 aluminium range starts with a Dura-Ace build with hydraulic discs at £2499.99. There’s an Ultegra version with discs at £1999.99 and without discs at £1699.99. There are also disc and non-disc 105 models priced at £1499.99 and £1299.99 respectively. The frame comes with a seat tube design dubbed Delta, which spreads into an oval cross-section at the bottom bracket junction for increased rigidity. The Synapse endurance road, Slice time trial/triathlon and cyclocross ranges remain unchanged for last year, although the Synapse now comes with a nifty out front computer mount built into the stem. Cannondale is also expanding its accessory range. This includes helmets with a new Cypher Aero and Road CAAD introduced for 2016. Its range also includes tools and bags which are designed in the UK. We liked the look of this Airport Nitro pump, which has a steel barrel and extra-large base with very grippy sintered foot pads.